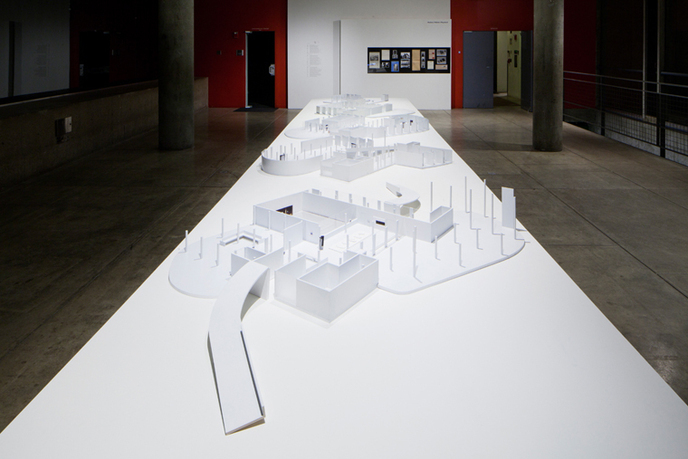 Carpenter Center Model-The Fictional Exhibition, Brute, Carpenter Center for the Visual Arts, 2013, Cambridge, MA. Photo: Tony Luong. Brute is an exhibition that highlights, teases out and responds to the history and use of Le Corbusier's brutalist icon, the Carpenter Center. 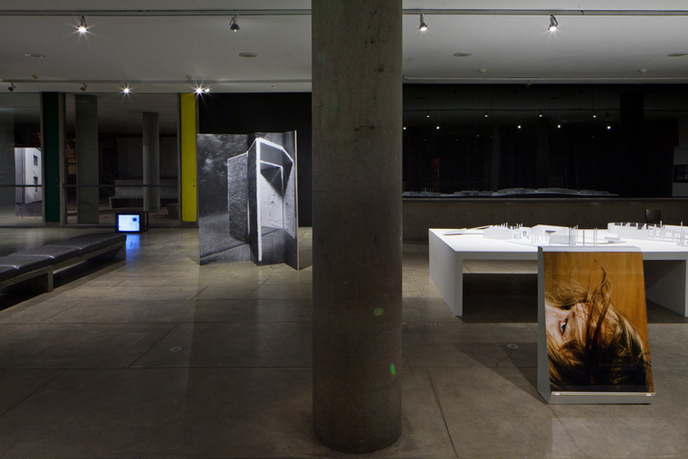 The main focus of the exhibition is the creation and inclusion of works by several contemporary artists whose practice engages architecture as reflection and documentation of time, gender and the iconic male architect, the cinematic in architecture, preservation versus change, the role of documents as "fact" versus fiction, the legacy of modernism, and the formal gestures of remaking, re-printing, and re-purposing as an analogue to the building's varied use over time. 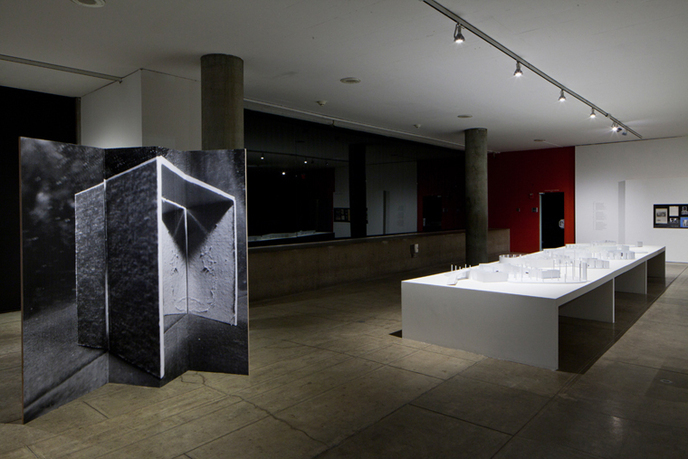 Drawing on a myriad of Harvard University collections, the exhibition will set artworks in dialogue with objects and images, and with archival documents and errata, provoking a discourse of use and misuse throughout the concrete and glass Carpenter Center. Currently Chair of the Department of Visual and Environmental Studies at Harvard University and Director of the Carpenter Center, David Rodowick is the author of numerous essays and publications: The Virtual Life of Film; Reading the Figural, or, Philosophy after the New Media; Gilles Deleuze's Time Machine; The Difficulty of Difference: Psychoanalysis, Sexual Difference, and Film Theory ; The Crisis of Political Modernism: Criticism and Ideology in Contemporary Film Theory; and editor of Afterimages of Gilles Deleuze's Film Philosophy. Rodowick founded film studies programs at King's College, University of London, and Yale University. Special research interests include aesthetics and the philosophy of art, the history of film theory, philosophical approaches to contemporary art and culture, and the impact of new technologies on contemporary society. 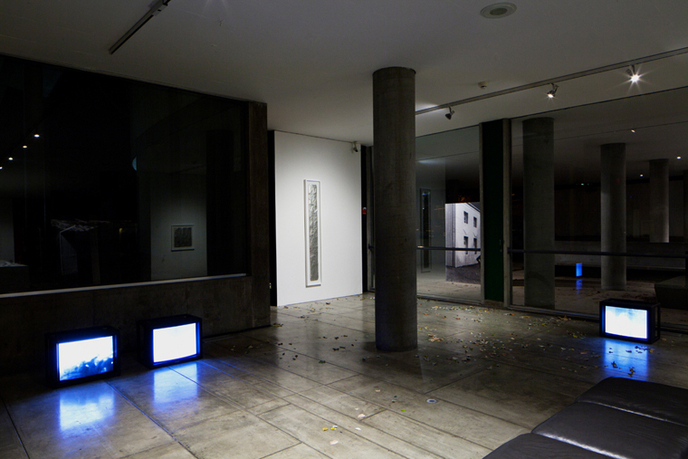 Rodowick has also been an award-winning experimental filmmaker and video artist. In 2002, he was named an Academy Film Scholar by the Academy of Motion Picture Arts and Sciences. Cocurator Katarina Burin received her MFA from Yale University and her BFA from University of Georgia. Recent solo exhibitions include Ratio 3 in San Francisco, and Galerie M29 in Cologne. Previous solo projects include Andreas Grimm Gallery, New York and Munich; Lucile Corty, Paris; Clockwork Project, Berlin; Country Club, Cincinnati, and Form/Content, London. Group shows include Galerie Max Hetzler and Gerhardsen Gerner, Berlin; White Columns, NY; Participant Inc, NY; Künstlerhaus Palais Thurn and Taxis in Bregenz. She is a recent recipient of the Schloss Solitude residency and received the Dedalus Master of Fine Arts Fellowship in 2002. Burin had residencies at the MuseumsQuartier in Vienna, Skowhegan, Yaddo and MacDowell. She was co-curator of the Institut im Glaspavillon in Berlin, inviting international artists to participate in thematic discussions and exhibitions. Burin's drawings, structures, larger installations and collages are influenced by the documentation and circulation of historical architecture and design imagery. 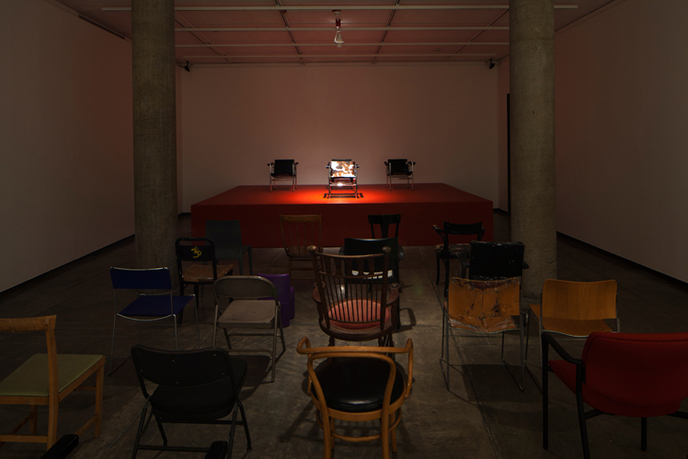 Ranging from photographs, sound, video and film installations, and feature films for the cinema, American artist and cocurator Amie Siegel's work re-orientates the fictions within documentary practices. Her work has been exhibited at the Whitney Museum of American Art, MoMA/PS1, Walker Art Center, Hayward Gallery, ICA Boston, KW Institute for Contemporary Art, Berlin and the Kunstmuseum Stuttgart. 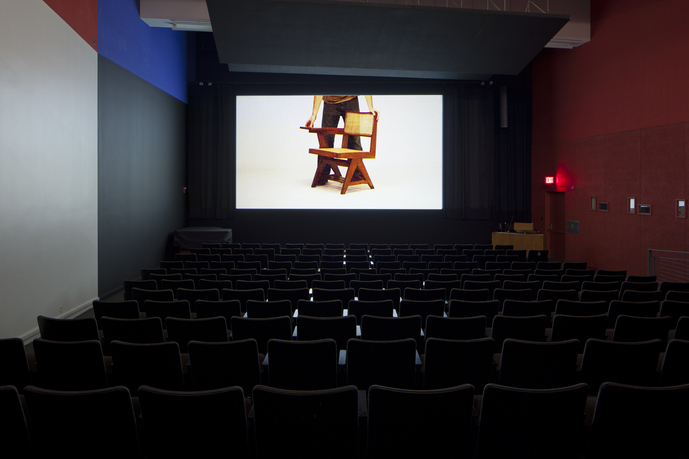 Screenings include Cannes Film Festival, Berlin International Film Festival, New York Film Festival, The Museum of Modern Art, The National Gallery of Art, and the Harvard Film Archive among many other museums and cinematheques. She has been a fellow of the DAAD Berliner-Künstlerprogramm, the Film Study Center at Harvard University, the Guggenheim Foundation and a recipient of the ICA Boston's Foster Prize. The Carpenter Center for the Visual Arts, completed in 1963, is the only building on the North American continent designed by Le Corbusier. 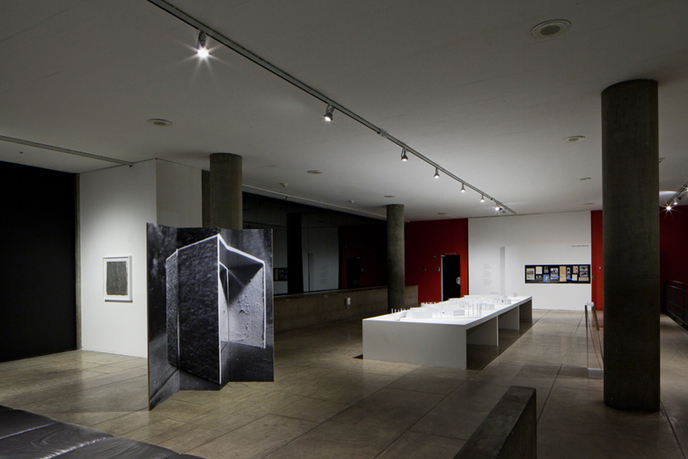 Despite the controversy over the wisdom of placing a building of such modern design in a traditional location, Le Corbusier felt that a building devoted to the visual arts must be an experience of freedom and unbound creativity. A traditional building for the visual arts would have been a contradiction. 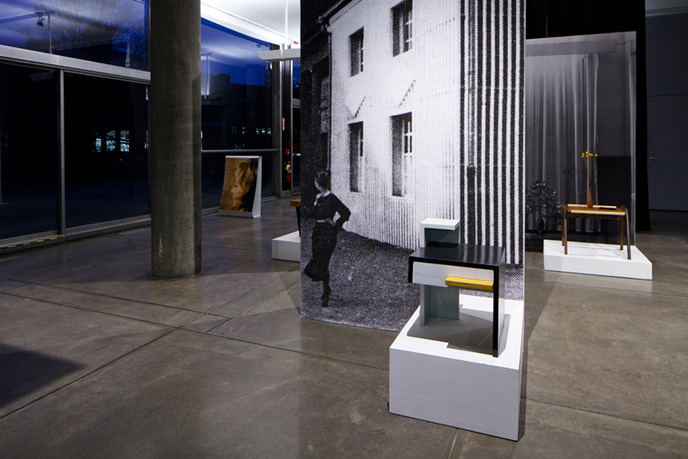 The Carpenter Center represents Corbusier's attempt to create a "synthesis of the arts," the union of architecture with painting, sculpture, through his innovative design. The building was completed in 1963, made possible by a gift from Alfred St. Vrain Carpenter, and the intent to house the artistic entities of Harvard College under one roof came to fruition in 1968 as the Department of Visual and Environmental Studies.